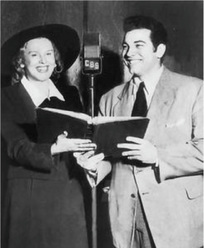 In October 1945 Lanza was assigned to the CBS radio program Great Moments in Music as a temporary replacement for the Metropolitan Opera tenor Jan Peerce. Over the next four months he sang selections from works as varied as Otello and The Student Prince. struck by the unmistakable beauty of the voice, together with the commitment and musicality of the 24-year-old tenor's delivery. Lanza, however, was dissatisfied with his singing, and after just six appearances on the show left to continue working on his vocal technique. It proved a fortuitous move, for he was soon introduced to the celebrated Enrico Rosati (1874-1963), former teacher of Beniamino Gigli and Giacomo Lauri-Volpi. "For 34 years, since Gigli, I have waited for this voice!" the 72-year-old maestro declared. Over the next fifteen months, Lanza studied intensively with Rosati, acquiring a much-improved sense of line, outstanding breath control, and a solid technique that would enable him to undertake the most rigorous of performing schedules. As Lanza’s friend and colleague the bass-baritone George London later remarked, "The voice [prior to working with Rosati] was unschooled but of incredible beauty, with ringing fearless high notes . . . Rosati directed him to singing more lyrically, with less pressure, to good advantage." Slowly, carefully, he took me laboriously through exercises, at first very pianissimo, for the entire gamut of my voice, so that now I can sing for hours without becoming tired. Such a training provides the drill which a singer must go through every day of his life. Lanza's voice, as Rosati soon discovered, was a perfectly placed lirico spinto of extended range (low A to high D) with a luscious baritonal coloring in the middle and lower registers. As the critic Henry Fogel has noted, "His voice had a uniqueness of timbre . . . that made it immediately identifiable," together with "an authentic ring [and] tonal support at all dynamic levels." Contrary to bizarre rumors, it was also the requisite operatic size, capable of projecting without any mechanical assistance in theaters as large as London's acoustically unforgiving Royal Albert Hall. In 1974, the vocal historian Henry Pleasants quoted George London as telling him that in terms of natural vocal endowment, Lanza possessed more voice than almost any other singer he had encountered. Intelligence and musicality were other readily apparent qualities of Lanza's singing. As Fogel observes, "He could be highly musical when he chose." Moreover, Fogel writes, "[Lanza] had an innate feel for leaning into a phrase that brings music to life." The Chicago Tribune's Claudia Cassidy took a similar view. Reviewing the first of the tenor’s two concerts at Chicago's Grant Park in July 1947, she observed that, "Although a multitude of fine points evade him, [Lanza] possesses the things almost impossible to learn. He knows the accent that makes a lyric line reach its audience, and he knows why opera is music drama." By now Columbia Artists Management had assembled what would become known as the Bel Canto Trio, comprising Lanza, George London (1920-1985), and soprano Frances Yeend (1913-2008). 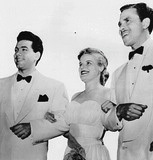 Between July 1947 and May 1948, the trio performed up to 86 concerts throughout the United States, Canada, and Mexico. Singing a demanding program that included scenes from The Magic Flute, Faust, Simon Boccanegra, and I Lombardi, the Trio received excellent reviews. The most significant concert of Lanza's life took place during this period, when the tenor sang at the Hollywood Bowl on 28 August 1947. Under the baton of Eugene Ormandy, Lanza performed three operatic duets with Frances Yeend and three arias. The next day, Albert Goldberg of the Los Angeles Times exulted that Lanza possessed "[t]he sort of tenor voice that nearly every operatic stage in the world has been yearning for, lo these many lean years." Goldberg went on to write that, "Lanza’s is the warm, round, typically Italian type of voice that caresses every graceful phrase and makes the listener breathe with him as it molds each curve of the melody." The audience was no less impressed, applauding the tenor’s impassioned rendition of the Improvviso from Giordano's Andrea Chénier for several minutes. Among those in the audience that evening was MGM Studio Head Louis B. Mayer. 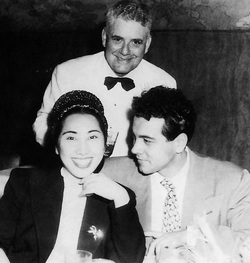 Immediately recognizing Lanza's potential screen appeal, Mayer promptly signed the good-looking tenor to a seven-year film contract at MGM. ("I'll make you a singing Clark Gable," Mayer told him.) Listening to a recording of that concert today, one can readily imagine the impact of Lanza's performance on the opera-loving studio mogul. Lanza is in ravishing vocal form, singing with a splendid sense of line, and switching effortlessly from the lyric requirements of "Una Furtiva Lagrima" to the spinto demands of the Improvviso. In the duets with Yeend, he reveals an impressive command of mezza voce and diminuendo in "Parigi, O Cara" from La Traviata and offers a passionate Pinkerton in the Love Duet from Madama Butterfly—arguably the highlight of the concert. Mario Lanza performed his duties as Lieut. Pinkerton with considerable verve and dash. Rarely have we seen a more superbly romantic leading tenor. His exceptionally beautiful voice helps immeasurably. . . .The combination of good looks and vocal ability should prove most helpful to Mr. Lanza in any of his more earnest undertakings. 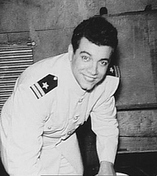 Lanza was booked to return to New Orleans in 1949 as Alfredo in La Traviata, but by then, as Armando Cesari observes, "he was already deeply engulfed in the Hollywood machinery and consequently never learned the role." Lanza’s decision to move to Hollywood would in fact prove disastrous not only for his then-promising operatic career, but for his health and self-esteem. Yet in 1947 it had seemed a logical enough choice. The terms of his MGM contract committed him to the studios for only six months of each year, leading Lanza to assume that he would be able to combine a film career with an operatic one. At first this seemed a reasonable supposition. Indeed, after signing with MGM, Lanza was able to continue touring with the Bel Canto Trio for a further eight months, as well as performing in Madama Butterfly and in concert with the Metropolitan Opera soprano Dorothy Kirsten. There were also other projects that augured well for Lanza's operatic potential. NBC was hoping to cast him (together with Yeend and London) in a television broadcast of Puccini's La Bohème for its inaugural Opera in English series. 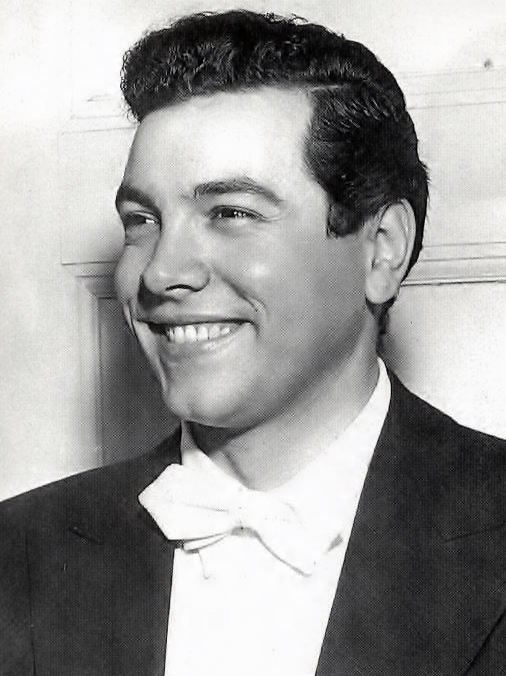 In May 1949, Lanza made his first commercial recordings, one of which ("Che Gelida Manina") was reportedly voted Operatic Recording of the Year by the US National Record Critics Association. The conductor on that occasion was Constantine Callinicos (1913-1986), a pianist who had previously served as Lanza's accompanist in recital—-and would go on to accompany him at all of his future recitals—-and who subsequently conducted all of the tenor's operatic recordings for RCA (with decidedly mixed results).